When you think of the land-saving work of a conservation organization, you may imagine large tracts of wildlife-filled forest, scenic mountains and streams in remote places, or vast areas of farms and open space. What you would not probably conjure would be buying methamphetamine-contaminated homes, clearing land of kudzu, trash, and billboards, or working to rejuvenate a city neighborhood long in decline. But that describes some of what the Lookout Mountain Conservancy has done recently, and it is not the first time Robyn Carlton and the board of LMC have stepped out of the box of the ordinary expectations of a land conservancy. Old Wauhatchie Pike, which skirts the flanks of the north side of Lookout Mountain directly across the Tennessee River from the foot of Moccasin Bend, originally began as an early Cherokee Indian path and wagon trail around the bluffs above the river. As the primary land route into the Chattanooga Valley from the west, it became a major road into Chattanooga and was used until the early 1900s. Union soldiers widened the road between 1864 and 1865, and its use continued until the construction of Cummings Highway around 1918, after which Wauhatchie Pike fell into disuse for most automobile traffic. In the early and mid-1900s, the neighborhood which grew up around this important roadway was an idyllic setting, a mix of large and small homes, some occupied by Chattanooga’s more prominent citizens, including the owners of Chattanooga industrial pioneers like the Scholze Tannery and Acheson Foundry. Rockmont, a long-forgotten neighborhood park in the mountainside neighborhood, no doubt was the scene of children’s play and family walks for several generations. But Wauhatchie Pike was blocked to through traffic and converted into a dead-end road more than a decade ago, and the neighborhood was largely forgotten. Old family homes become rentals, aging houses became hard to maintain, and sections of the neighborhood deteriorated. 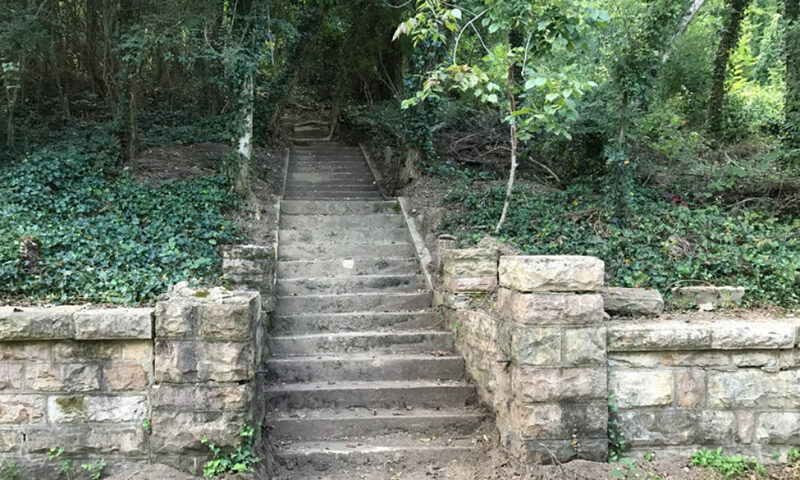 As the Tennessee Riverwalk extension to St Elmo was planned, the LMC board decided that the creation of a connection from the Riverwalk to its popular Guild and Hardy Trails on the old railroad line ascending Lookout Mountain was a natural fit, so the Conservancy began acquiring property in the Wauhatchie Pike neighborhood to make it possible. Two early acquisitions were from descendants owning long-held family homes which had fallen into disrepair. Other homes did not have such a genteel history, including a meth-contaminated property with a bank lien that took two years to resolve; another acquired in a bank foreclosure, and another with the remains of a burned mobile home. The largest lot had three billboards under lease, which have now been removed. After 6 years of work and numerous acquisitions along Old Wauhatchie Pike, coupled with previous acquisitions of the “adult motel” and water slide property (now John Wilson Park), the Conservancy had secured the land on which to build a trail, and then some. While virtually all of the land had been part of the historical residential neighborhood in the past, much of it had become littered with garbage, bricks, tires, bricks, kudzu, other invasive plants, and more bricks. In developing its strategic plan to build a connector trail and revitalize the old neighborhood, the Conservancy board committed to preserving all of the land needed for the trail, plus the green swath along Cummings Highway, the areas of significant Civil War conflict, and the land surrounding the upper end of the road now listed on the National Register of Historic Places, all while protecting the green vistas seen from downtown. LMC also committed itself to making the property more accessible to casual walkers enjoying the wooded slopes, serious hikers or cyclists connecting to all of the Lookout Mountain trails, climbers interested in bouldering in the developed climbing areas, or gardeners learning in a brand new neighborhood teaching garden. While some land trusts understandably prohibit access to environmentally-sensitive areas, LMC is inviting enjoyment of this land, which is less than 8 minutes from town and very close to new developments in Chattanooga’s burgeoning south end. In a novel turn which is intended to resurrect residential vitality in this historic neighborhood, the Conservancy is also seeking developers to help turn the excess land not needed for the trail system and green space into a strengthened residential community. This concept would allow the Conservancy to pay off debt incurred in the acquisitions, add homes in limited areas not needed for the trails or significant to historic preservation, and provide stability, safety and activity to the area. The concept will allow small homes to be built close to Old Wauhatchie Pike in some of the old homesite locations, hopefully creating a diverse neighborhood of new homeowners along with the existing homeowners who have taken pride in their homes for generations. The development will have to comply with a master plan and will be subject to restrictive covenants that are consistent with conservation, preserving some of the large trees, minimizing excavation, and limiting height and structure footprints. The Conservancy is applying to the City to annex properties it owns currently, and then to propose a new “Planned Unit Development” that will allow it to work with a developer to build as many as 24 new homes in the first phase. The development area, if approved, will contain about 3 1/2 acres, while the protected area will be over 40 acres. While this work has been much more difficult than a typical land trust project, Lookout Mountain Conservancy believes that the combination of green space, residential neighborhood, and recreational amenities will help protect and stabilize this neighborhood and the conserved park areas for generations to come.